Memo display boards are very applicable and functional pieces in home décor. Between writing out important reminders and displaying memorable pictures for our own enjoyment, memo display boards are informative just as they are a decorative item for our home. into a handy wall organizer. Before you get started, shield the surface you’re working on with newspaper and administer your spray adhesive onto your cork board. To determine how much fabric you’ll need, measure the cork portion of just the bulletin board and add no more than 4 inches to both the height and width. Center your fabric on the cork board and smooth the fabric out evenly into place. You can turn the fabric edges into place and pin them down. You may choose to embellish your board with decor ranging from gold vellium paper to glitter designs. Unfold your stapler and staple the edges of the fabric (inside edge of frame). Continue stapling till your fabric is completely secure. Remove all pins and place the ribbons to form diagonal lines from one another. To determine the placement for the ribbons, divide the board into fourths or thirds and use your straight pins to hold the ribbons down at each intersection. Continue stapling ribbons crisscrossing them until board is completely finished. 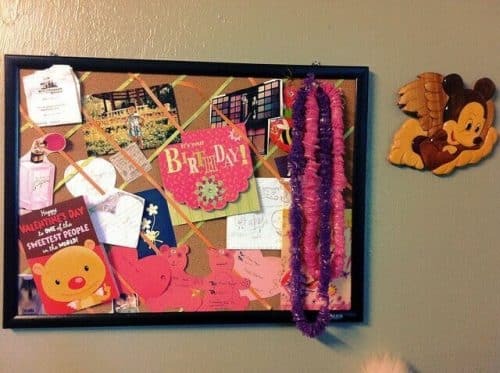 You can hide the staples you’ve made around the entire board by lining the edges of frame with ribbon. Secure the ribbons by placing your upholstery tacks where the ribbons meet and continue placing tacks at each intersection.